Scout Nation, last we spoke was before Thanksgiving, and I halfheartedly promised to post over that holiday. I should have known it was not to be. Aside from Bosco being laid low with a cold during that time, I was pretty much paralyzed emotionally and creatively by the impending layoffs that my coworkers and I knew to expect upon our return in December. As it turned out, my job was safe and I am still employed. I know I should feel lucky that in these economic times I didn't lose my job, but mostly I feel that I kept my position at too great a cost. You see, in addition to several other brilliant coworkers/treasured friends in my department, my boss--known on this blog as Il Duce--was also laid off. "So, in this scenario, [Department Director] is Hitler." "So, therefore you are Mussolini." As the real Mussolini's nickname was Il Duce, I thereafter bestowed the nickname "Il Duce" to my boss, especially here on the blog. This past Thursday, 12/4, my coworkers and I watched as several people were led into our now-director's office to be given the official news. In what I consider to be The Biggest Blunder Ever Made by a Corporate Entity in the History of Capitalist America (tm), Il Duce was the first called in. Several of my coworkers and I watched in disbelief, in tears. We considered a Quaker-type protest....a huge group of us standing silently outside the director's door, conscientiously objecting to Il Duce's passage to Human Resources for his 'outplacement counseling.' But we knew it would do no good, so we just continued to watch and cry as more and more of our dear friends were led down the hall and then to HR. Me: I'm EXTREMELY unhappy about this. Il Duce: I understand that, and it's okay. But please, be happy for me. I'm happy. And then he walked off. HUMMING. All the people laid-off in my department were kept on the payroll another week, ostensibly to take care of unfinished business and transfer things to other folks as needed. Il Duce was back on Friday morning, wearing dress clothes with a tie, no less (we have casual Fridays, and I've been so apathetic [and fat] as of late I've not gone beyond jeans for the past couple of months). I went into his office for one final session of inappropriate questions. Another detour: (I don't think I already mentioned this on the blog, but if I did, give me a break, ok? I had an 8-hour meeting today followed by a 2-hour Brownie Christmas party in *extremely* close quarters. My long-term memory is shot.) One of the best things about working for Il Duce is that I could ask him anything, tell him anything. I referred to this as my "inappropriate" sessions with him. Almost every day, I would go to his office, close his door, and either tell him things I shouldn't regarding office politics, etc, or I would ask him company questions that were not rightly my place to know the answer to. He always gave me an honest answer when he could, told me he didn't know when he seriously didn't know, and told me he couldn't tell me when it was OFFICIALLY none of my business. I cannot begin to express how much he taught me not just through his answers but also through his treatment of me and his serious commitment to my growth as an editor. So last Friday, the day after Black Thursday (that's what we're calling it) , I went to his office for one more inappropriate session. I asked him, "Are you *really* happy about this? Or are you just putting on a brave face for the rest of us?" And he stopped his file-purging, looked me right in the eye, and said this: "Let me tell you something. I couldn't sleep last night. And the reason is because for the first time in many years I'm EXCITED about my future." This gives me comfort, though I have absolutely NO idea how I, much less our department, will get along without him. Il Duce was just coming up on his 18th anniversary with the company. The monumental amount of institutional/publishing knowledge that walked out the door with him is staggering. Despite his long tenure in the industry, he had visions for the future, was still taking risks, was ready to meet the challenge of the digital age full-on. But it was not to be. And that's a damn shame for me, my company, the publishing industry, and the children of America. Il Duce and I met about 14 years ago...he was still a baby editor, too, with just a few years' seniority over me. We never worked on the same products at that point, so he was always just my friend (and also my chemistry consultant). Occasionally, before he became such a high-falutin' exec with the company, he would grab me as we walked past each other in the hall and start waltzing with me. (He was instructed to give those kinds of shenanigans up as he rose to the management level of our company.) He came to my wedding. I have a treasured picture of him holding an 8-wk-old Bosco at a company party. Only once I returned to the company after a 4-yr hiatus did he become my boss---and our friendship deepened as we developed the most rewarding working relationship I've ever had. Today was his last day in the office, and he spent it cleaning out his files and turned over lots of materials to other people. He was still there this afternoon, as I was leaving. I stopped in, and he honored the two requests I made of him before he left. 1) He can affect an awfully stern, loud voice that he often used to faux-yell at me: "DAMMIT [my last name], WHAT THE HELL WERE YOU THINKING?!? This never did a lot of good, because I always dissolved into hysterical laughter whenever he unleashed it. At my request, he yelled at me one more time this afternoon--after I ensured that there were still coworkers around to hear it. 2) One last time, we waltzed together in the hallway. At the edge of tears, I broke away and told him I would miss him and that I love him. He replied in kind, but then said, "Ill be around...we'll be in touch." And that simple sentiment will be the last line of the 2008 Science Department quote list, which those of us that remain have decided to shut down after today. I will post that quote list here soon. Long live Il Duce--my friend, my colleague, my boss, my mentor. He will be missed...in so many ways, but most especially just as an everyday reassuring presence in my daily life. P.S. Much to the Jr. Scouts' delight, Il Duce left me his company candy jar, which he always had filled with M&Ms. I vow to keep that jar always filled for the (dwindling) remaining editors in our department who need a sugar fix. Who knows...maybe I can even make them laugh by faux-yelling at them or answering and/or evading their inappropriate questions. Honesty, though? I don't feel anything like fine. Well today I think I'll tell you about my goals for later and maybe some other stuff. For now I'll tell you about my education plans and hobbies for later. I plan to go to S.C.A.D. the Savannah College for Arts and Design (blogger's note: I keep telling her there are art and design schools much closer by!!! ), and I plan to do gardening, and rock studying for hobbies (blogger's note: Grandpa Scout lives on...). Professions now okay? I want to be an author, illustrator, and publisher (blogger's note: how proud is my little editorial self???). I also want to be a gymnastics teacher. I want to be an author, illustrator, and publisher so that I can make a book publish it and send it out, and gymnastics is fun. My wishes for the future are to have no more cars, but to have bubble travel (blogger's note to self: cut back on the 'Jimmy Neutron' viewings). To have pictophones, and jetpacks that run on steam. I also want to have bikes that have solar engines, a.c., and a juicer. Ow! Oh hi! Sorry, I was checking on the bruise I got from a three legged race. What's that? You want to hear about my school days! Okay! Well first I'll tell you about the schools I've attended. I've attended Stepping Stone (preschool), Children's Network (preschool/afterschool care) and Summitt Elementary (now). Teachers? Okay! Well there's Ms. Jessica who I didn't like because she was so mean. I liked my kindergarten teacher Ms. Eddins because she was sooooooooooooo nice. Ms. Wilson, my first grade teacher had so many class pets that I can't even count them! My second grade teacher Ms. Hudson had reading groups, and I was in the advanced one. Ms. Anne my after school care teacher is cool. She lets us make lemonade. Let me tell you about five of my friends. Camryn is kind, very playful, and she won the box tops this morning. Riley is fun to be around because she is awesome, and she is with me right now. Kyla is really hilarious, she tells the best jokes EVER! Lillian is so imaginative that she imagined a monster that ate everything. Samantha is a six year old who was crazy! She moved to South Carolina though. Field trips and Events? Well I went to Krispy Kreme with Stepping Stone, and I made a donut there too. I went to the library with Children's Network. I went to the "Nutcracker" with third grade, and I went to "Charlie and the Chocolate Factory" with second grade. Hobbies? Well I've enjoyed art, reading, and collecting rocks. They're all very fun to do, especially the art. YAY for art! Rocks can come in all shapes and sizes that's why I think they're cool. Reading is the best thing ever. All of those are AWESOME! It's true! They're the best EVER! I also like to build. I built a cart out of tinker toys once. Favorites? Likes first, and it's a deal. I like reading the most as I told you earlier. Math is second. Reccess is third. YAY! Dislikes for school? That's easy! Veggie Dippers. Bluch! Lunch Moniters. Raaaaaah! Type To Learn! I mean why did they invent those! Well bye! Did you know that my mom's full name is [first middle last], and my dad's is [first middle last]? Weird huh? They have almost the same initials! They met at the Carousel Lounge in October because they had a friend named Lance who introduced them. They got married in Austin on September 27, 1997. I have zero brothers, and one sister who's name is [Bumby]. Here's something really funny about her. She was with my mom at my mom's checkup, and she was poking around in the trash can, and she fell in head first. Then the doctor and my mom yanked her by her feet and she slid out. Her birthday is on April 29, 2001 by the way. My mom's parents are Grandma and Papa and they are special to me because they let us stay there in our mom's old room. My dad's parents names are Nana and Grandpa and they are special to me because they invite us to Colorado in the winter, and send us presents on holidays why just the other day I got 4 6-Flags season passes for my birthday. My birth date is March 22, 1999, I was born at St. David's Hospital, and my mom's 1st reaction to me was "Look how long her fingernails are!" and my dad's was "Look how perfect she is!". My parents favorite story about me is that I used to love the baby in the sun on Tellitubbies. I don't know why though. Now you know about my early years. Hi! I'm [first middle last name]. I'm 8 years old, but I will turn 9 in March. I am 4 feet 4 inches in height and I weigh 62 pounds. I'm very skinny because I run around a lot. I'm sort of strong, and I'm very very flexible. You could twist me into a pretzel and when I untwisted I'd still look the same as I did before I untwisted. I have blue silver eyes, golden blonde hair, and cherry colored lips, but when I was skipping on some tile floor I fell, and had to go get stitches in my chin. I'm such a fashion freak, I've wanted to be on a fashion show called "Project Runway" ever since I first saw it because it's funny, and you get to design clothes, and if you win you get 10,000 dollars to sell your own line. [Blogger's note: it's actually $100,000, but I'd take 10K too.] I'm also energetic because I enter lots of races against my sister who's pretty fast and hyper. I'm also pretty smart because I study a lot and do all of my work so I get lots and lots of A+'s. Bosco is in AISD's Gifted and Talented program for Language Arts. (Yes, I'm bragging, but there is a point. Oh, BTW, Bumby is also G/T for Math.) For her G/T special project in 3rd grade, Bosco had to create an autobiography. The final 'book' came home with her at the end of the year. Here, in various posts, I'm going to share her autobiography with you. Chapter 1 to follow shortly. Though it would seem I haven't been doing a lot of writing lately (most of the stuff here of late has been mostly YouTube posts with a tiny bit of analysis), I have in fact been writing. At work. "Students often view science as a subject isolated unto itself, as opposed to an integral part of the world—indeed, the universe—they live in. The intent of our relevance strand is to show students, through eye-catching imagery and engaging text, the myriad ways that science is everywhere, in everything. To capture the wide-ranging interests of our diverse audience, this strand will focus not just on relevance to the student’s own life but on other engaging areas as well: sports, the environment, technology, the cute and whimsical, the gross and scary, forensics, the arts, history, social issues, and more." Il Duce declared it perfect, and it also passed the hurdle of our department director. Now we'll have to see how the Marketeers respond. Is this very exciting to the Scout Nation? Probably not. Am I being show-offy? Maybe a bit. But it feels like the first positive thing to happen in my work life in a long time, so there you go. the remains of my old life. three of their own kids. reminders of what has gone. Recently I was granted a half-day off of work, a blessed interlude of a few quiet, nonfrantic hours before I needed to pick up my two daughters from school. My drive home through my neighborhood took me past my daughters’ elementary school at recess. As I do anytime I find myself near their school during the day, I scanned the playground and field for a possible glimpse of my girls. Usually I don’t see either of them: they take recess seriously, such that they are either crawling stealthily through a playscape or are tucked behind a tree, giggling with a friend. But on this beautiful sunny day, on this particular drive past the school, I got lucky. About halfway across the playground, I saw her. My heart recognized her before my head had even processed what I was seeing: the bouncing golden curls, the "Dancing With the Stars" t-shirt, the purple camo tennis shoes she had so proudly picked out the week before. It was my older daughter, Bosco. She had her back to me, joyfully running in the other direction with her best friend. I keep a photo by my desk that was taken of Bosco when she was about 18 months old. It’s a lovely picture, taken by a friend of mine who’s an accomplished photographer. Many beautiful photos were taken in that session, of Bosco alone and of Bosco and me together. (Her younger sister, Bumby, was still just a gleam in her daddy’s eye.) However, of all the photos taken that day, more than seven years ago, I’ve kept this one photo out and in a place of such prominence that I cannot help but see it every day. At first glance, it looks like a photo for the keep-but-don’t-frame pile. It’s not your typical ‘happy kid beaming at the camera’ shot. 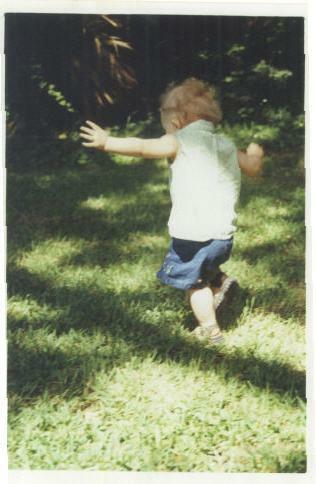 Instead, the photo shows Bosco clearly moving away from the camera; she almost appears to be skipping. Her still-deliciously-chubby arms are outstretched, obviously in joy, though you can’t see her face. The photographer was so skilled that Bosco looks stopped in time, but you know—you just know—that she’s in motion, that she’ll keep moving away from the camera even after the camera shutter clicks. I keep this picture near to remind me that no matter how much I love Bosco and her little sister Bumby—no matter how much I want to hold onto them and sometimes never let them go—that it’s their work in this world to leave me. It’s essential to their growth and development to explore the expanding world around them, to delight in amazement at all the wonderful things life has to offer. It’s also their job to discover sometimes that the world is a difficult and painful place—though it’s my prayer that their difficult times will be few and far between. (I’d actually wish for no difficult times for them, but I know that that’s part of growing up, too.) My job is to let them go, to watch with joy and pride and hope as they continue to grow and move further and further from me. Looking at that picture informed me as to what to do on that ordinary school day. I wasn’t supposed to stop, get out of my car, and call her over to the fence. I wasn’t supposed to interrupt her time with her playmates. Instead, I knew I was meant to drive past (perhaps a tiny bit slower than usual) without her even seeing or knowing I was there. In turn, she was doing what she was meant to be doing: running and playing, hair flowing behind her, arms outstretched in playful joy. Bosco was unaware that I was so close to her, but I savored my unknown nearness. I felt blessed to witness that one ordinary moment of her day. I was mesmerized by this brief glimpse into her life, her life, which is becoming larger and filled with more and new experiences every day. Her comfort with these experiences means she needs me less and less (in some ways) every day. I was also struck by the strength of the joy, longing, love, pride, and tiny bit of grief I felt as I watched her running away from me—as I watched this huge part of my heart having a carefree moment on a sunny playground day. Run, Bosco, run. Throw those arms wide open. Remember to show Bumby what you’ve learned and to reach back and take her hand as you both encounter the world’s offerings for the first time. I’ll always be right behind you both. You may not know I’m there, but I’ll be watching with joy, longing, and pride. And I’ll wave and blow a kiss if you happen to look back and see me. Today, 4/19, has been a banner day so far. Whoa, just spent like an entire minute making sure that my parens and brackets were used correctly. Got up this morning to find an email saying that my essay has been accepted to run in a local parenting magazine in May. And they're going to pay me $50. Yep, Scout Nation...I am now a PROFESSIONAL WRITER. Woo hoo! I'll post the essay here soon, it's actually based on a shorter blog entry you may have read here months ago (http://sweetscout.typepad.com/sschronicles/2007/08/one-shining-ord.html). Then, went to see my hair guru Brenda, who gave me the most awesome cut and color yet. If you live in Austin and are looking for a hair genius, contact me. You need to know Brenda. When I returned home, I found an email from Comedy Boy saying he'd finagled BACKSTAGE PASSES to the Brian Regan show tomorrow night. I get to meet and greet my most favoritest comedian ever (who coincidentally was the force that caused my world to collide with Comedy Boy's). And the Junior Scouts love BR so much that I can shamelessly ask for autographs and pics and say "it's for my kids." Could this day get any better? [in the style of Brian Regan] I submit that it could not!!! And yet...it's only 3:30. Stay tuned. Due to my stream-of-consciousness method of downloading songs from iTunes, fairly incongruous songs are often heard back-to-back on my iPod. "World," by Five for Fighting, comes right after Elton John's "Saturday Night's All Right for Fighting," which as I mentioned previously I've been hooked on lately. But Bumby's gotten hooked on "World," so we've been listening to that a lot, too. As I've listened to it lately, I can't help but think of my mentor and dear friend, Robert. His world has changed completely as of recent. It may not seem like it now, but I think it might end up being the best thing that ever happened to him (though certainly not for those of us who miss his everyday presence). So, I dedicate this to you, Robert. I can't wait to see what masterpiece you produce with your life next. "Sunlight's on the way...tomorrow's calling." P.S. Thanks to your encouragement, I'm taking baby steps in the world of writing. I'm entering an essay contest for a local parenting magazine. I'll keep you posted. Hooray! Another John Mayer song to post. This is (as you can tell from the video) from the soundtrack of "The Bucket List." I know this song is about telling people what you need to tell them before it's too late. But for me, it's resonating on a whole different wavelength. I once told my old friend Whit that I was afraid to start writing because I didn't think I would ever stop. Turns out I was right, but I'm no longer afraid. Though this blog started as a way to share the girls' lives with those who don't get to see them as much as they'd like (and it still serves that function), it has turned into more. It has turned into a place where I say what I need to say. And in the words of the Dixie Chicks, "It turned my world around, and I kinda like it." Thanks to all of you who have said kind things about my writing and who have encouraged me to do more and take it further. Especially you, Robert...your encouragement almost brought me to my knees, because I know your instincts about such things are unerring. Wow. So, what next? I'm not sure. Keep reading. I'll keep writing. Than never to say what you need to say again..."
--My dad died at age 41. Therefore, I always believed that I'd die at 41. Apparently others in my family shared this feeling. Feels strange, almost guilty, to make it past. --Having said that, I'm damn glad I made it to 42. Year 41 was not a good one for me...too much illness, work confusion, failed relationships, deaths of beloved family members/friends/pets, illness, and more illness. This year can only be better. --Sometimes I can feel a little sorry for myself, doing the struggling single parent thing, working a job that requires so much brain/time commitment, feeling that I'm falling short in every single damn way. But then I have a run of fun with people who show up to hang out with me, people I know who would be there at the snap of a finger if I needed them. So I must be doing something rightish. --On my birthday last year, Nana and Grandpa took me out to lunch for my birthday at Cool River. I was/am soooo grateful that they always considered me still part of their family. Sadly though, that was the last time I ever saw Grandpa. I treasure that day. I've not been able to go back to Cool River since. --People generally respond with disbelief when I tell them I'm turning 42. Maybe if start any sort of even tiny skin-care regimen I can keep the looking-younger-than-I-am thing going for a while. Or maybe those folks are just referencing my immaturity. --So far (though the day's not over yet), I've managed not to horribly embarrass and almost cripple myself by free-falling onto my knees on a concrete sidewalk. Which means that tonight I just might not have to spend my birthday night with icepacks covering my horribly bruised and swollen knees. --I can't wait to get my girls back tonight, to share some cheap HEB bday cake with them (cheap, but the best in my book), laugh and just be back in their presence. They're truly my greatest gift. --GG, I can't help but think/say this over and over ala Brian Regan's Hooked on Phonics bit: "HAP-PY BIRT-HA-DAY TO MEH!!! HAP-PY BIRT-HA-DAY TO MEH! MEH!" --Last night, on the drive home from my hang with Comedy Boy, I just had to listen to this song over and over on my iPod. I declare it my 42nd birthday theme. Longing, wistful, but grateful for all that there was even if it's fleeting or already gone. Just got this story back from Bumby's first grade classwork...her teacher thought it was a complete hoot (the teacher was also Bosco's first-grade teacher). This story SO exemplifies Bumby's feelings about being the younger sibling, I think. Anyway, keep in mind that the class was just beginning to learn writing based on the "How? Who? What? When? Where? Why?" model. Think of all the things you would do if you were a black cat. Then write a list. One of the most important qualities of a good editor is being a good writer...or, more specifically, a good rewriter. But there's a dilemma that all editors I know have faced at one time or another: editing their own writing. This is an almost impossible task. It's incredibly hard to be objective about something that you created. To take your big red pen and start marking up and rearranging and deleting stuff...well. Forgive me for a gross overexaggeration, but it's almost like "Sophie's Choice." How can you possibly decide which of your offspring you are going to sacrifice? But as an editor, I rely on gut feeling as much as knowledge of grammar or subject matter. If something isn't working, I can tell. It sticks out, it remains with me as I read and re-read, and slowly but surely the problems make themselves known. One rule I've learned to abide over the years as an editor is "When in doubt, cut it out." At this point, you're all looking at each other going "What the hell is she jabbering about?" Here's the thing. I created a category last Thursday..."Dedication Thursdays." I didn't give it a lot of thought, I created a post that I thought frankly wasn't that great, and for the wrong reason--to impress a boy (a Republican boy, even). As the day passed, it just didn't feel right. It felt too forced. And then I realized that, you 6 readers excepted (yes! the numbers are swelling! ), I really don't like that many people. I would quickly be struggling to find anybody to make dedications to. So despite the tears of the writer who created the baby, the editor in me decided it had to go. That category is now defunct. In it's place, I've created a new category "Quotes", which I think will be much more fun for all of us. There's not much I love better than a good quote. These quotes may come from movies, coworkers (we keep an annual quote list on our department's server), friends, books, anywhere. "I do good work, I just have a bad attitude." However, as my lists so often do, The Queue is becoming too long to entrust to only my brain. And I just can't cope with one more damn piece of paper to keep track of. So, dear readers (yes, all 3 of you), I'm putting the Queue here. It may even become it's own category. So if I ever seem to be running out of steam or relying too much on my ADD "Looky what I found on YouTube now!" tendencies, send me a shout-out saying "Hey Scout, what about [insert Queue item here]?" So, shut up already and start writing it down before you get distracted again. And it may not be apparent right now, but at least half of these are about or relate significantly to the Junior Scouts. on a bunch of drunken strangers.